Indonesian men have tiny feet! 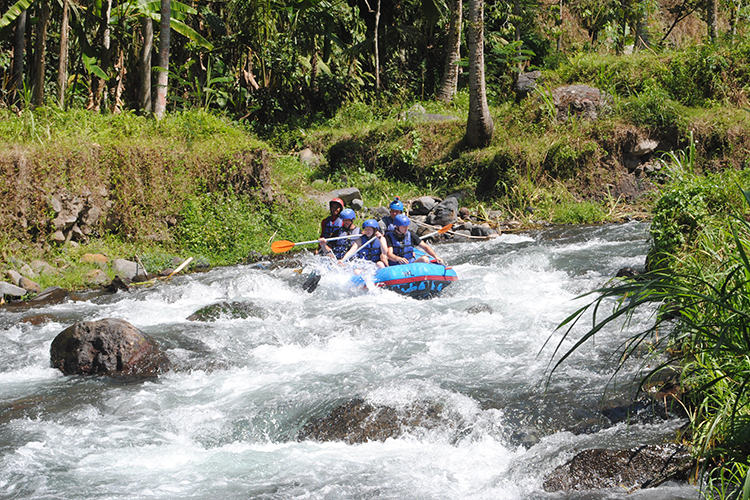 This was the revelation that kick-started our white water rafting adventure in Bali. A few days earlier, I had arrived at the conclusion that I was somehow qualified to take my wife’s job and organize a day out. I was now paying for this mistake. Knowing me a little too well, Amy decided to double-check my arrangements to see what I had missed. Sure enough, I had failed to read the big red letters: All adventurers must wear “strapped thongs”; an unholy marriage between sandals and flip-flops. Being the semi fashionable guy that I am, I hadn’t thought to pack a pair of these abominations into my travel bag. It was 9:00 pm the night before our adventure and I was walking the streets of Kuta, trying to find a vendor with a pair of strapped thongs that would fit me. Alas; despite the valiant efforts of so many salesmen, no one was able to squeeze my size 11 feet into the size six shoes that they were selling. Despondent, shoeless, and self-conscious about my grotesquely oversized feet, I returned to our guesthouse. 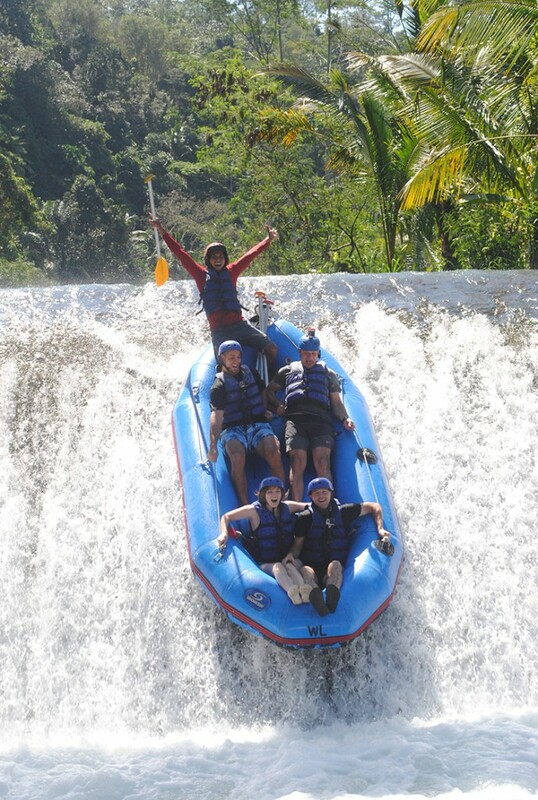 In just a few hours, Amy and I would risk life, limb, and flip-flop on a three-hour white water rafting trip through the tropical forests of Bali. The least that we could do was get a good night’s sleep. The next day, flip-flops and duct tape in hand, the fun began. We were picked up at 8:15 sharp by Wayan; the friendliest driver in Bali. 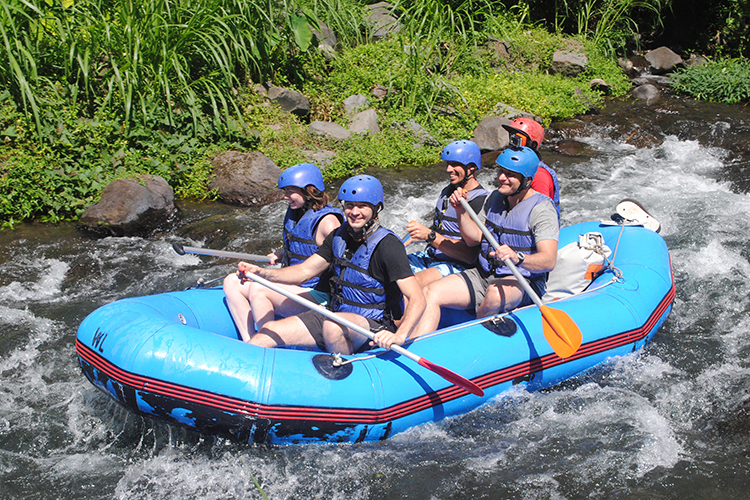 Together, we collected four other adventurers from the Kuta region before setting off on the two-hour journey to Telaga Waja River; located in eastern Bali. 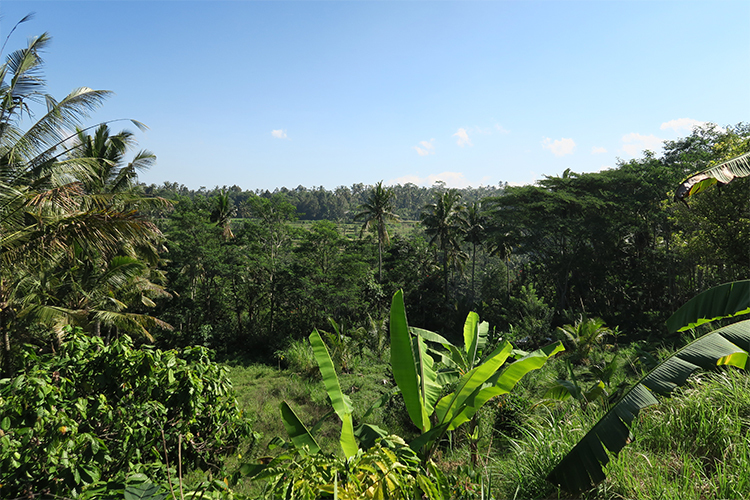 Before I continue, I must just mention that Bali has some stunning countryside. We ended up using half of our cameras battery snapping shots of rice paddies, mountain views, and waterfalls. After ten days in the highly overpopulated Kuta region, the open space, fresh air, and natural beauty was a welcome change. 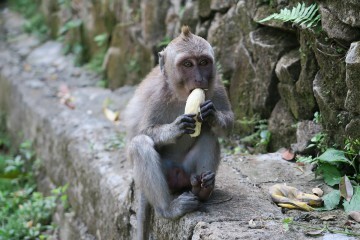 Of course, a trip through Bali wouldn’t be complete without the locals trying to sell something. This time, however, it was well worth it. 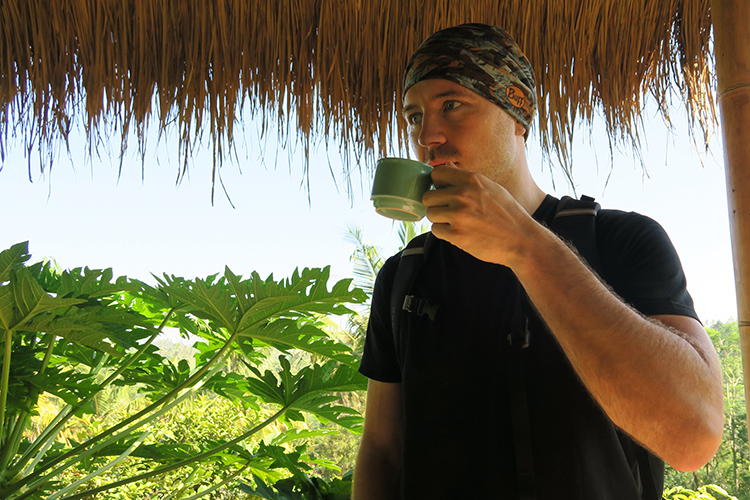 About an hour into the trip we stopped for a “break” at a beautiful coffee plantation; this picturesque plantation was elevated and offered incredible views over the surrounding forest canopy. Here we were given a quick tour where we got an inside glance into the creation of some of the most interesting coffees that I have come across. Not being much of a coffee fanatic, this isn’t saying much, but it was an experience all the same. 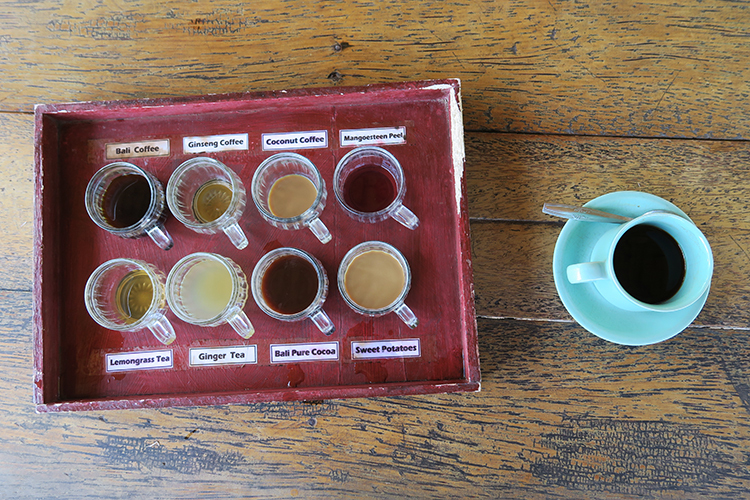 We got to taste eight different coffees and teas before getting the sales pitch at the end. 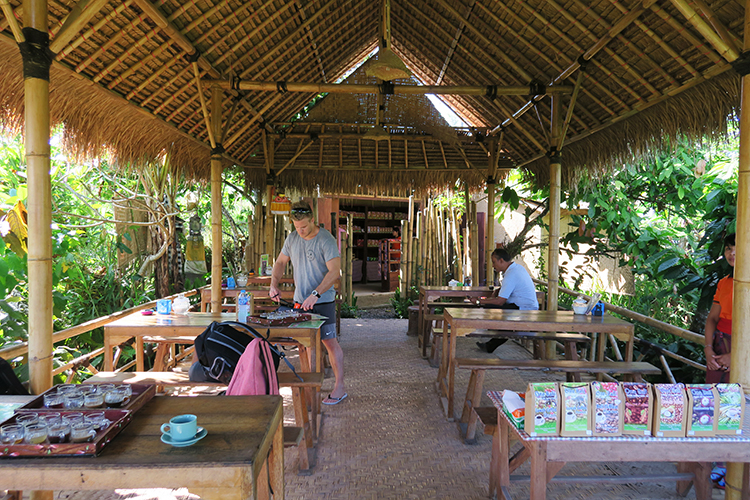 In true Balinese style, these guys weren’t shy about hard-selling us a couple of bags of coffee beans. They didn’t manage to sell me any coffee beans, but they were able to sell me a cup of something else; something that I found far more appealing. Apparently this coffee is the most expensive in the world, fetching $50 – $100 per cup in the US. The best thing about it is that it’s made from only the freshest ingredients. Newly laid toddy cat poo. Yummm! 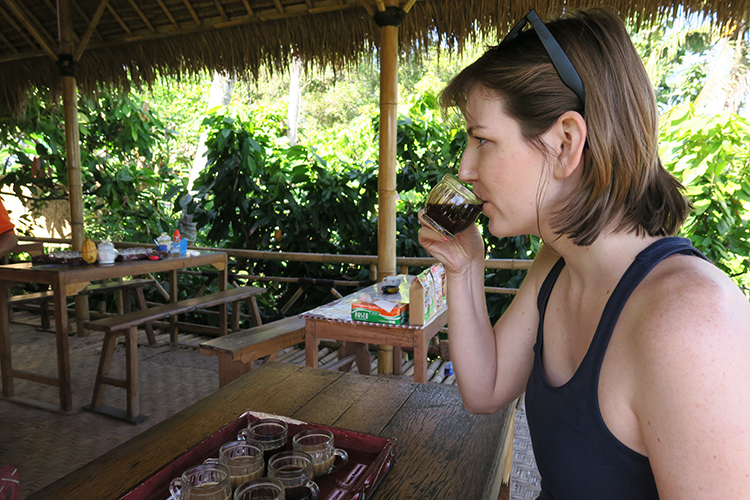 According to our tour guide, “Kopi Luwak” is made from coffee beans that have been eaten and then defecated by the Asian Palm Civet (also called “toddy cat”). The animal is also fed an assortment of fruits to add flavors. Seriously, these guys eat better than I do. Once the beans get passed, they are cleaned, dried, baked and crushed into a ridiculously expensive powder. I couldn’t pass up the opportunity to taste something so different; at least by my perception of normal. So I bought myself a cup of Bali’s finest for Rp 50 000 (less than $5). Bottoms up! 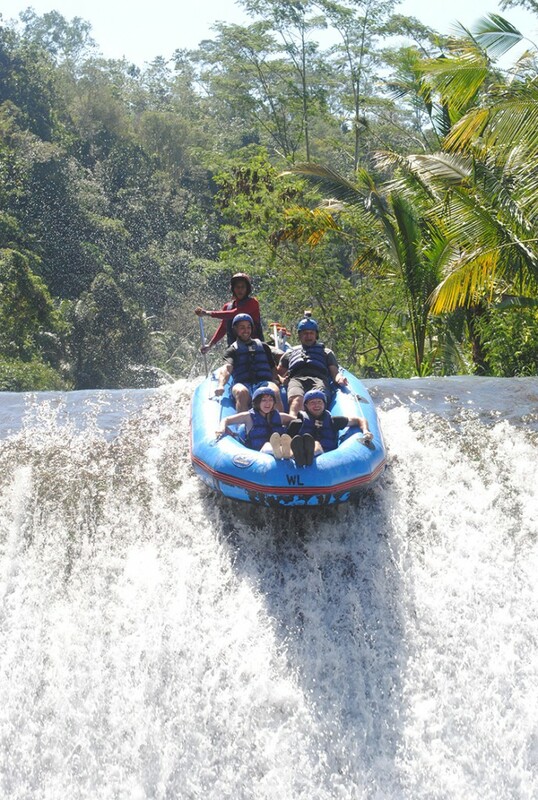 Once our coffee fun was over, it was back to the van and on to Telaga Waja River. When we arrived, we were met by a most glorious sight (other than the river itself); strapped thongs! Have I mentioned that these guys never miss an opportunity to make a sale? They might have mentioned this particular upsell along with the red letters of warning, though. We strapped on our life vest, helmet, and shoes and attached our cameras. Once we were suited up, we headed down to the river. Safety first! Our instructor gave us a one-hour lecture on white water survival in about five minutes. 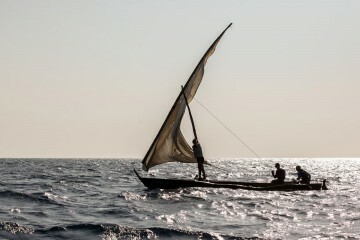 On the bright side, I think that he was speaking English for at least part of the time; something about what to do when you fall out of the boat? Anyway, it probably wasn’t too important. And then, finally, we began our 17 km journey down the river. In the past, Amy has been more of a city girl. Her first concern, for example, was the fashionability of her helmet. 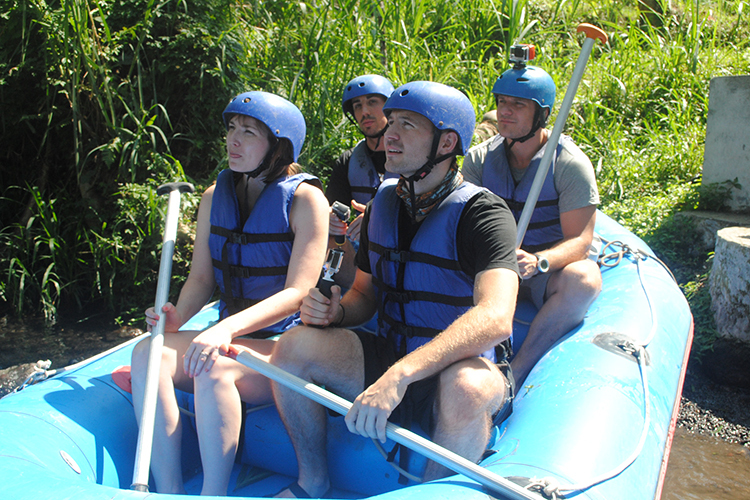 As we set off, I watched her face as she slowly came to terms with the reality of her predicament; she was about to crash down a river in an inflatable raft with four guys. Her eyes said, “what have I done”, but there was no turning back now. I have to give her credit, though. After a few close encounters with fallen trees and an assortment of fast moving obstacles, she was wielding her paddle like a pro. 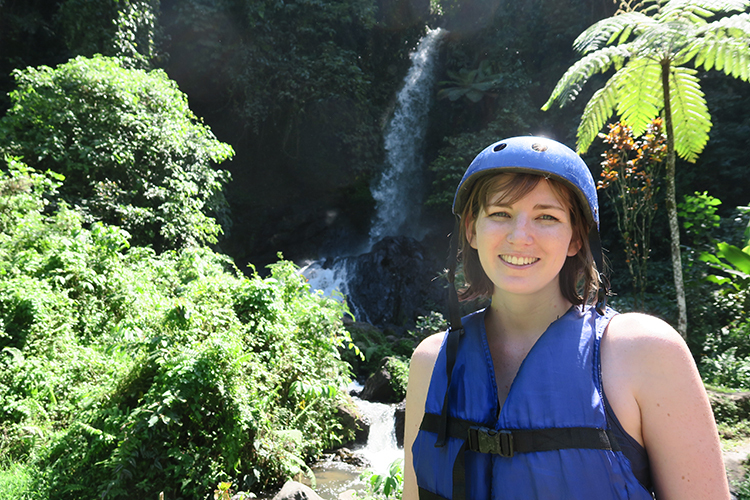 As the river took us into the tropical forest, the scenery became progressively more spectacular. 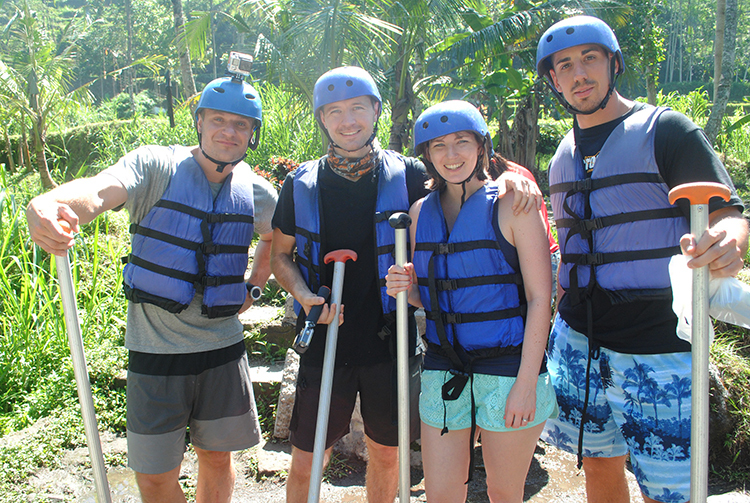 We were floating through a deep valley, surrounded by lush vegetation including wild banana, coconut, and other fruit trees. The experience was surreal at times as there was no indication that we were close to civilization for the majority of the journey. 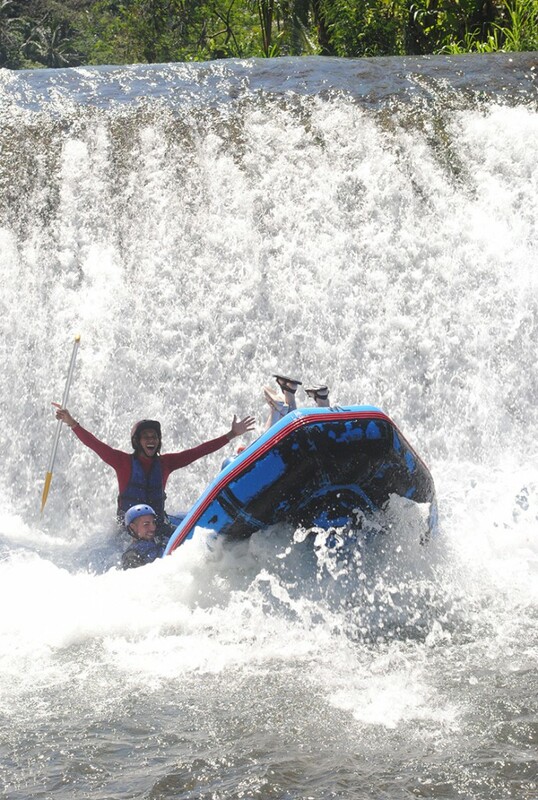 Our time on the river was an even split between coasting through calm waters and screaming for our lives as we crashed our way over, under, and through a variety of obstacles, including other rafters. Ok, this may be a slight exaggeration. 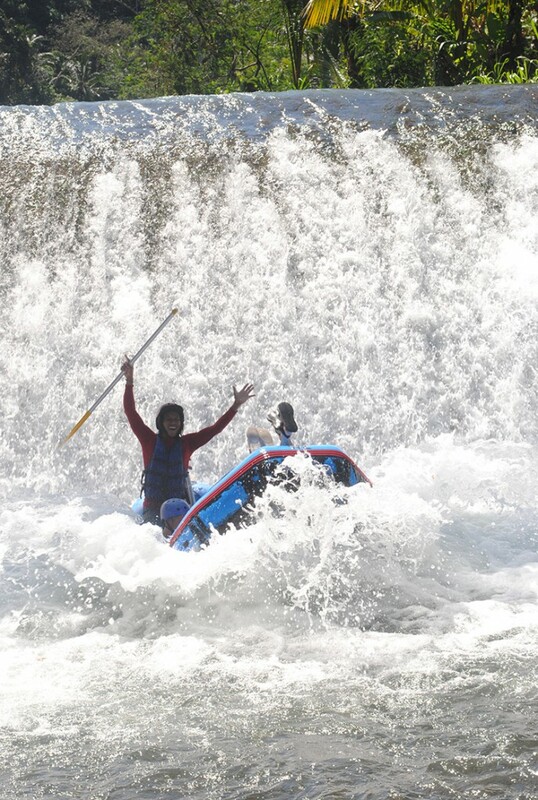 These were class four rapids, which offered their fair share of exciting moments, but didn’t induce the fear of death too frequently. We also pulled over for a couple of breaks as we went, the most beautiful of which was at the base of a towering waterfall. At each of these stops, we had the (highly encouraged) opportunity to buy drinks. “Bintang” (a type of beer) became our Indonesian word of the day. Every few minutes someone would tap me on the shoulder and ask, “Bintang?” (in as many words). I don’t know how far we ventured into the forest, but it felt like we were in another world. At one point, we saw a guy crouching in the distance, washing something in the river. When we got closer, we realized that he was stark naked… in the middle of nowhere! This guy certainly added some flavor to our “lost in the jungle” experience. 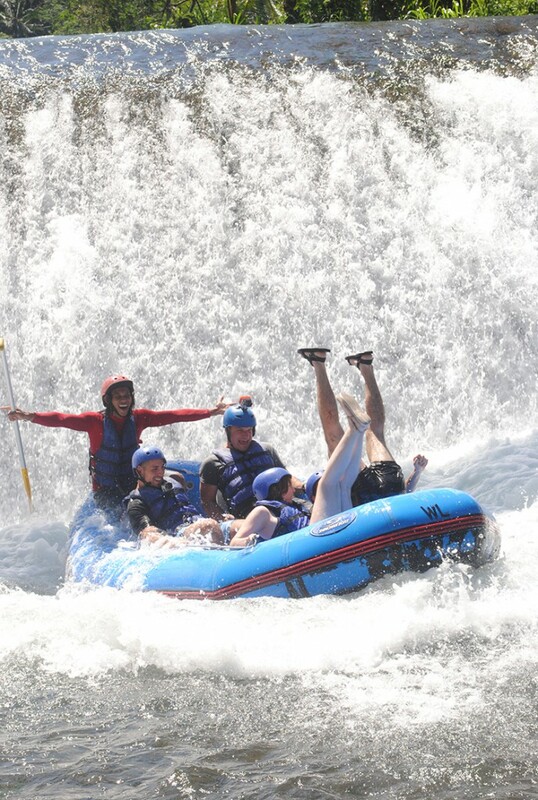 As far as the rapids are concerned, they saved the best part for last. About 20 minutes from the end, we were told to assume brace positions and turn on our cameras. It was time for the final drop. Until this point, we had spent a considerable amount of time slamming into obstacles and trying desperately to keep our raft upright. We hadn’t, however, been air born yet. That was about to change. The “last drop” was the climax to our 17 km route. 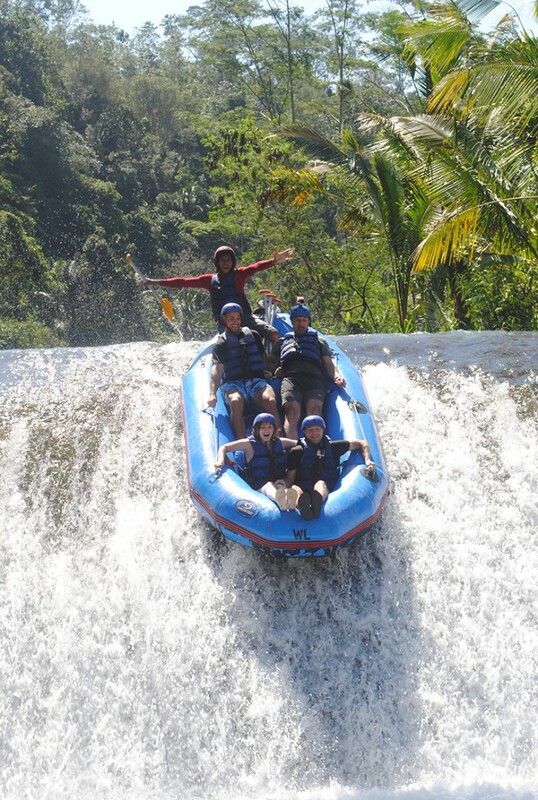 The drop was over the edge of a five-meter high waterfall, but in an inflatable raft, it would feel a lot higher. We went over the edge, enjoyed a couple of seconds of near weightlessness, and then slammed into the water with surprising force. On impact, my body contorted with the boat, and I managed to catch a glimpse of a mole on my backside that I had forgotten existed. All things considered, this was, for me, the highlight of the experience. Even Amy loved it! 20 minutes later, we were back on solid ground enjoying having an Indonesian lunch (deep fried chicken bones in batter) and recovering from an exceptional day. Absolutely. This adventure was well worth the time and money. 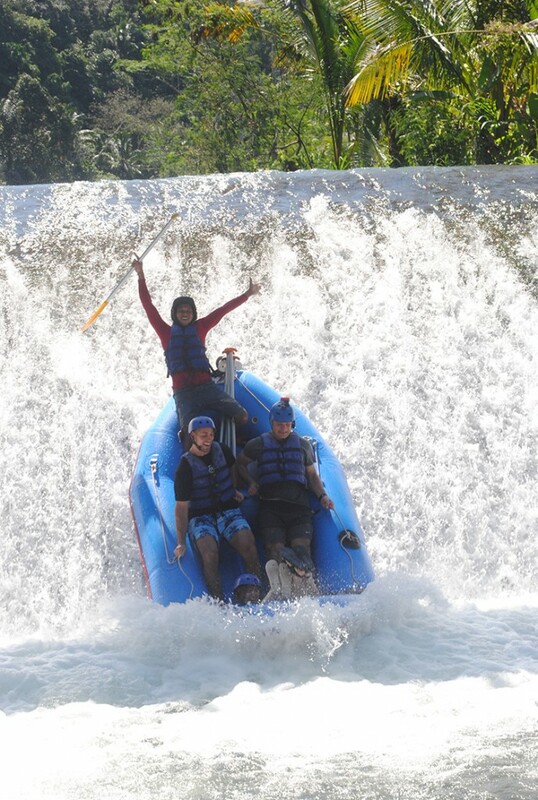 The rapids are powerful enough to be exciting without posing any real danger. It’s also dirt-cheap. 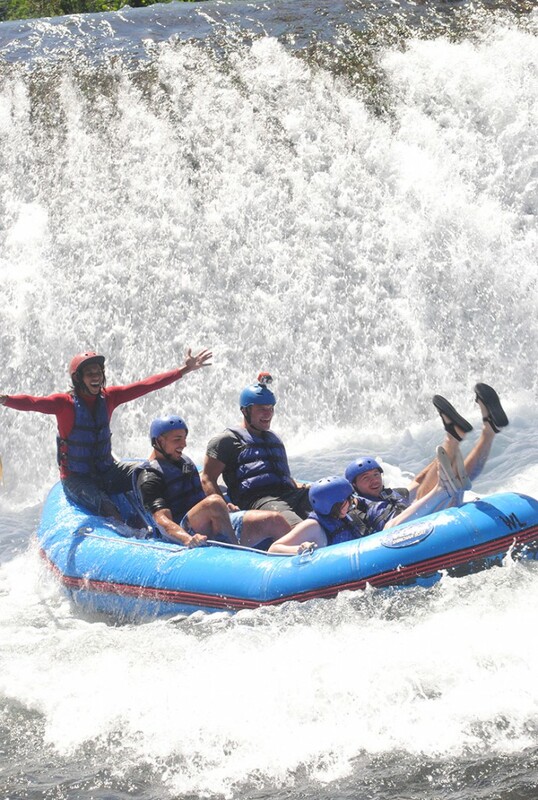 Including coffee tasting, lunch, transport, and close to three hours in the water, this experience cost us an unbelievably low $30 per person. We booked the trip through GP Bali Tour (www.gpbalitour.com). They are one of the most highly rated Bali based tour companies on tripadvisor.com, and we were happy with their service on the whole. The only disappointment for us was the pictures. We paid Rp 350 000 (just under $35) for 100 shots of the day. As it turns out, the photographer set his camera to a multi-shot mode and took 10 – 20 pictures at a time. He took pictures in five locations, which gave us our “100” pictures. This issue is probably not unique to GP Bali Tour, so keep it in mind before you order pictures. I’m amazed. I must say, seldom do I encounter a blog that’s both educational and entertaining and, without a doubt, you’ve hit the nail on the head. TToo few folks are speaking intelligently about this problem. I’m very happy that I stumbled across your blog on my hunt. I loved the ‘legs in the air’ shots. I noticed the guys behind weathered the fall with more dignity. The guide had no trouble at all! You guys certainly got the hot seat for that one. Well done, Amy. Our guide was amazing. Often I would look back and he would be having the time of his life with almost his whole body hanging out of the boat. I guess when you do this multiple times a day you get used to it pretty quickly. I fear that this sighting may be the first of many. I remember that cat poo coffee only too well – it seems to be an acquired taste, but I have yet to meet anyone who has acquired the taste??!! Perhaps a great marketing strategy……? And I also love the photos, especially the 2nd last one. Had such a good chuckle!! 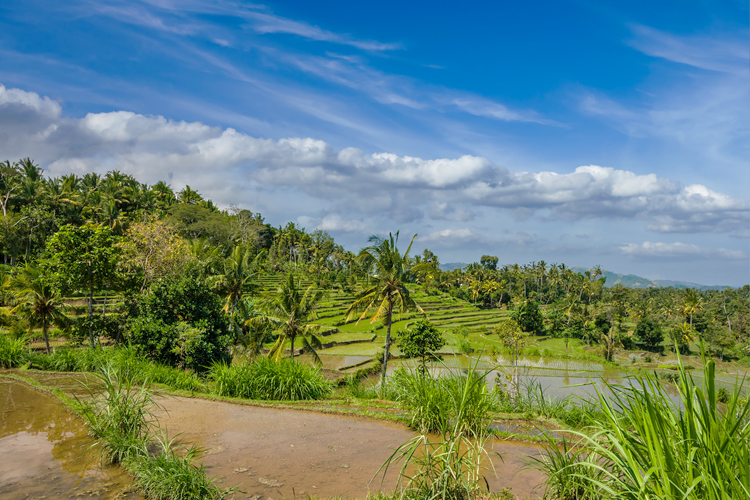 It looks like you had an amazing day, and Bali is just so beautiful. I’m glad you got to see a bit of the countryside, away from all the tourists. The cat poo coffee is most certainly an aquired taste. I just couldn’t get around the fact that it came out of an animal… Yuk! Thanks, Bronwyn. I agree. Not many people can off the “strapped thong” look due to the straps, but I think I did a pretty good job. You should’ve seen how quickly I pulled them off when we got out of the water!